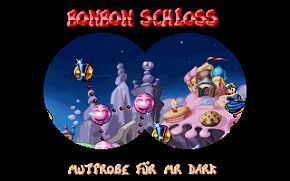 You enter the world of desserts where Mister Dark is hidden, guarded by clowns carrying out amazing stunts... Be careful, Mister Dark is diabolical. No cages here in the Candy Chateau! Rayman 1 Cheats :: Here in the Candy Chateau, cheats dont work! Cake - Level 01 - No enemies in this level. to make it up the hills in the frying-pan . Cake - Level 02 - Bad Rayman is here . . .
Mr Dark creates an evil Rayman whose touch you must avoid. 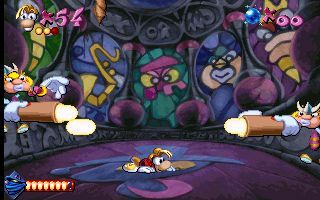 Try to stay as far ahead of Rayman as possible, but remember, if he does catch up to you, it is possible to jump over him and gain some more time. Mr. 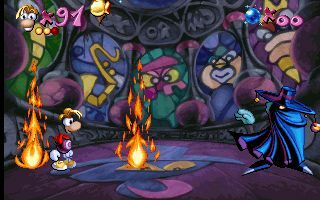 Dark places a spell on Rayman which reverses is left/right directions. This will last until halfway through the level. Mr. Dark is lurking in wait after the third photographer. His spell forces Rayman to run. Watch for a power-up on an upper path of chocolate. You will need the health points! You now have another opportunity to meet Mr. Dark face to face. Stay in between the balls of fire, even when they begin to shrink on you. First you will fight Skops. Getting past him is a matter of jumping over the claw that he throws and punching him in the head. Next, you will encounter two Space Mama's. Try to stay towards the middle and duck when one of them shoots so that they fire upon each other. Finally, Moskito will appear and shrink you. Stay near his feet. Each time he jumps in the air, use your running power to avoid getting stepped on, jump in the air before he hits the ground, and punch him in the head. make it up the hills in Level 01.
over him and gain some more time. the photographer took a picture of you. Rayman 1 - Cheats :: Here in the Candy Chateau, cheats dont work! 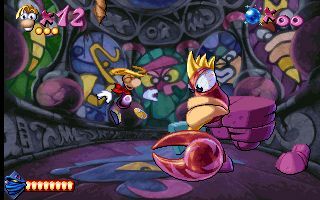 Different versions of Rayman use differing sets of cheat codes. If one set does not work in your game, try a code from the other set.